Guizot, Minister of Public Instruction. Lith. Anst. von Pobuda, Rees et Cie.
Guizot remained as Minister of Public Instruction almost continuously for nearly five years and was unrivalled in this position throughout the XIXth century and even beyond, with the exception of Jules Ferry. 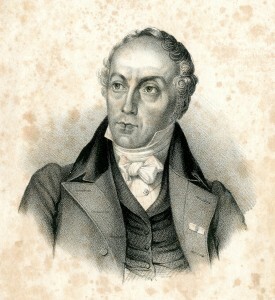 His major contribution to posterity is the Law of June 28, 1833 which created the French national primary school system. It became obligatory to open a school in each town and a Training College for primary school teachers in each department, and a primary school inspectorate was created. Guizot also gave considerable impetus to historical studies and the enhancement and recognition of national heritage. This successful period of his political life was, however, darkened by personal tragedies. In March, 1833 he lost his second wife, Eliza Dillon, and on February 15, 1837 his 21 year-old son Francois by his first wife Pauline de Meulan, François, for whom he had bought the Val-Richer estate in 1836 in his constituency of Lisieux, also died. On April 15, 1837 Guizot left the Cabinet due to disagreements and increasing rivalry with his superior Mathieu Molé, against whom he was soon to lead a parliamentary uprising in an unorthodox coalition with centre-left Adolphe Thiers and left-wing Odilon Barrot. Having become politically cumbersome, in February 1840 Guizot was appointed ambassador in London where he made a very strong impression, but could not avoid France becoming diplomatically isolated when the Turkish crisis took place. Thiers was then President of the Council, but the King did not appreciate his warmongering attitude towards England and he was replaced by Marshal Soult at the head of a very conservative government, in which Guizot was appointed Foreign Minister. He was in fact its most influential member, due to his excellent abilities and exceptional oratory talents. He held this position for eighty-eight consecutive months, a record for longevity that has never been equalled, even to this day. Order and prosperity at home and peace abroad were the pillars of his policy, in complete agreement with Louis-Philippe who felt understood and protected by this tireless and unshakeable minister, even in his conservative outlook. England was France’s principal rival in Europe but thanks to the friendship between Guizot and his English counterpart Lord Aberdeen, an “entente cordiale” was established between the two countries from 1841 to 1846. 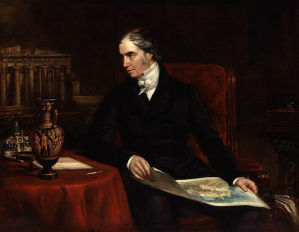 This enabled many political crises to be overcome, the most important being Tahiti, the maritime Right of Search and French intervention in Morocco, as well as persuading London to accept the French occupation of Algeria, finally conquered in 1847.In 1846, the replacement of Lord Aberdeen by Palmerston, who was hostile to France in general and Guizot in particular, put an end to this “entente”, and the Spanish marriages affair, a political success for the French minister at the expense of England, caused considerable tension between the two countries. Guizot then seemed to turn more towards the absolutist powers on the continent, principally Austria and Russia. His liaison with the Russian born Princess von Lieven, beginning in 1836, laid him open to criticism even though in reality, she had no influence on his politics. On the home front, Guizot endeavoured to form a real conservative party on the English model in the Chamber of Deputies, capable of giving him the strong support he needed. For a long time, he only had a small and unstable majority which he tried to consolidate by distributing favours and positions, for which he was later severely criticised. Only the 1846 elections totally satisfied the Cabinet, but it is true that more than one third of the Deputies were then civil servants. Guizot, however, obstinately refused to accept any reforms that would have enlarged the electorate by lowering the “cens” (the tax-based voting requirements) and forbidden members to hold certain positions in public office whilst they were Deputies. He considered that the institutions resulting from the 1830 revolution were still too recent to be modified and were sufficient to satisfy the needs of society, these being essentially liberty and prosperity, and that any reform would encourage the revolutionary spirit that would be difficult to restrain. Although it was never certain that he actually uttered the famous phrase “Enrichissez-vous par le travail et par l’épargne” (Become rich through work and thrift), he would undoubtedly have agreed with it. Appointed President of the Council on September 19, 1847, he was becoming more and more unpopular and found himself isolated with a much diminished majority and an ageing King. 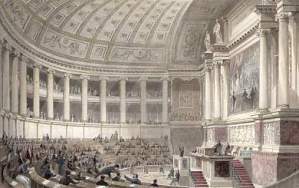 Faced with this blockage, a “banquet of reforms” campaign was launched in July 1847, resulting, to the surprise of its instigators and to more or less everyone else, in the Paris revolution of February 24, 1848 and the establishment of the Republic. Guizot and his family were immediately obliged to go into exile in London. His political career was over in a spectacular fall that obliterated the great significance of his achievements, which included raising the minimum age of child labour and the overall organisation of the railways. 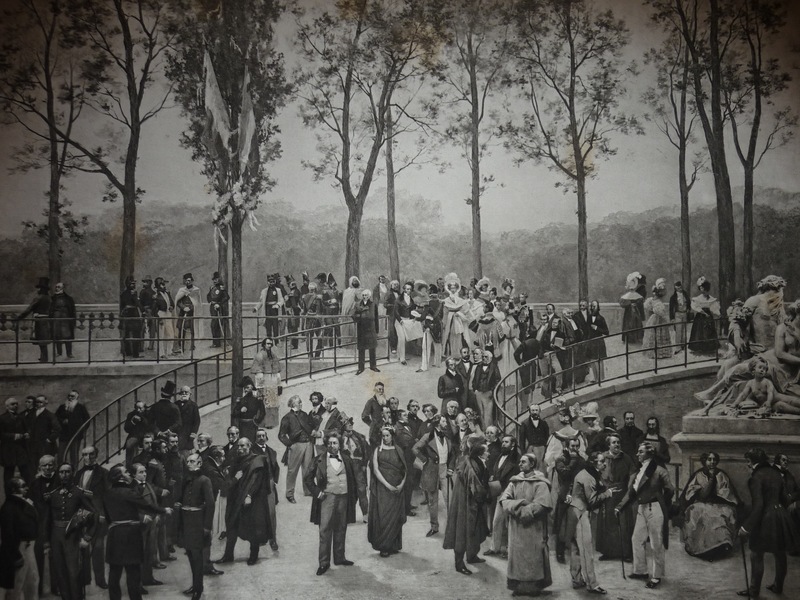 Guizot in the Tuileries. History of the Century. 1789–1889. Painting by MM. Stevens et Gervex. Heliography Dujardin. Picture by Pierre Petit. 1830–1848. Clicking on the image, we can see, among other personalities, François Guizot, on the top left of the ramp, isolated.